Sending a shout out to POA Client and Paralympian Igor Ivanov, who participated in the Snowboard Cross competition along with Amy Purdy and Evan Strong today. 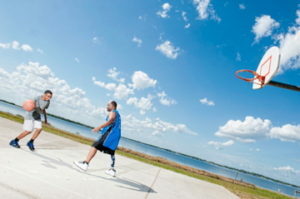 Igor represented Russia and put in a great effort– as an ABOVE KNEE AMPUTEE wearing a prosthesis! Well done, Igor! POA’s Scout Bassett breaks World Record! Author adminPosted on November 18, 2013 Categories Amputee Athletes, ArticlesTags above knee amputee, amputee, amputee running, athlete, florida prosthetics, orlando prosthetics, paralympics, prosthesis, prosthetic, Scout Bassett, world recordLeave a comment on POA’s Scout Bassett breaks World Record! The time was 3:30 am on June 5, 1993, in Pereira, Colombia. Hernan Knob, then a 22-year-old college student, had just finished a shift at a popular night club when he heard a knock at the door. As Hernan turned the knob and opened the door he was met by a blinding light and tremendous explosion. What happened next forever changed the path of his life. From childhood I always knew what I wanted to be when I grew up… then, I started to follow the path that would lead me to it. There were a few obstacles along the way, but these difficulties never stopped me. It was clear that football (soccer) was my favorite sport. I played a little more than five hours a day. As I grew up, I knew I would soon have other responsibilities, and the time to pursue my dream of playing major championships and even become a tournament champion was diminishing. Still, football remained my passion. My mother was adamant that I attend school and concentrate on my studies. I was an excellent student, and quickly realized that the secret of getting good grades was to be attentive in class and do my homework. This strategy helped me excel in my classes, and likewise I realized that I liked my teachers and enjoyed learning from them. However, when I became a teenager I began to like other things and my studies took second place behind football. When I was 15 years old, my brother introduced me to what would become another passion–salsa dancing. It was more out of curiosity that I learned to dance salsa, and my brother taught me every time he learned new steps. In less than six months my dancing made me a popular kid, and my school friends always wanted me to dance and teach them steps. The girls wanted to dance with me, and that is how I met my first girlfriend. My mother introduced me to many things in life, including faith in God and attending church. I grew up Catholic and always tried to follow the principles that she taught me. I had the good fortune of attending one of the best public schools in Bogotá and the country. I chose to study industrial chemistry, and dreamed of being a scientist in a laboratory inventing something new. After finishing high school, knowing that I wanted to continue studying chemistry, I applied for college and was accepted by a public university away from my home in a city called Pereira. I started my studies in 1990, but duty to my country called me into compulsory military service. The time I spent in the service was a meaningful experience which I learned a lot from. 18 months later, I returned to the university, hoping to finish my studies in chemistry. The economic situation was not good, and I had to find a job. My best friend helped me find work as a DJ at a bar he also worked at. On 5 June 1993, working a normal night, we finished our work at about 3:30 am, and were about to receive payment of our wages. My friend, who by that time was the business administrator who together with the accountant made the payments, paid me first and told me to rest for a few hours because it was finals week and in a few hours I would need to be back to my studies. However I was stubborn, and decided to wait for him to finish so we could go home and study together. A few minutes later we heard someone knocking at the door of the bar, and when I opened it I was greeted by a loud explosion. The walls fell down on me, like they were part of the roof, and I was so confused. The first thing that came to mind was that they were going to kill everyone in the bar because by this time the country suffered a war between drug cartels and there were many attacks in Pereira. I started yelling at people inside to take shelter and to remove the debris that had fallen on me. Once I was up I tried to run outside but I fell to the floor. I tried many more times, but I always went to the floor. I managed to drag myself and made it a few feet where I met my friend, who comforted me a little and I fell asleep in her lap and began to dream. My dream was both strange and pleasant; while walking through a vast hallway I felt a rush of exhilaration and a bright light shone. There were pictures on the wall, and when I got to the last one I experienced great sadness. The picture showed me in the disaster, and the pain in my legs was so strong. I cried as I realized I could not play football again and I desperately wanted to wake up from the nightmare. When I woke up I immediately gave thanks to God for ending the nightmare, but a second later I realized it was not a nightmare and was my real life. They were pulling me out of the club and all I wanted was something for the pain. I thought I had broken my leg and it hurt me to my soul. I had prepared for more than seven months for a great football event –the University National Games. Despite my pain, I was confident that the hospital would put my leg in a cast and I’d be walking and possibly competing again soon. In the hospital emergency room my thoughts were complex. The pain was intense and sadness overwhelmed me as it became clear I may not play the championship. My mind did not allow me to understand many things, and finally, after asking all the nurses for something to stop the pain, they put a mask on my face and my endless pain finally ceased. I awoke in the recovery room, feeling a heaviness in my body and a great thirst. As I tried to move, I heard a nurse tell me that I was recovering from surgery and I should not try. I was obedient for a moment, but felt the need to assess my injuries. I started with my hands and arms. I saw many cuts and abrasions and IV tubes, as well as other lines connected to the screens, monitoring my vitals. But the minute I tried to move my legs, the right one did not respond. I thought that perhaps it was because I was very tired and weak. Then I pulled away the sheet that covered my missing leg, and upon seeing it, I fell into a panic. Then I felt intense anger and began shouting and asking why they cut the leg. I also blamed God for giving me this punishment. I did not understand. I had never been a bad person, I was obedient to my parents and the church. Why me? After the shock wore off I began thinking about my future. Since I could no longer play football, perhaps I’d take up chess. I also considered becoming a scientist so I could invent a leg that would let me walk and dance again. At this time I made changes in my life and career plan. I never lost the desire to live, and was optimistic about my future, always hoping for the best. After almost nine months of hospitalization, I tried to return to my studies, but they were interrupted at least twice a year for surgeries necessary to save my remaining leg. But the surgeries were ultimately unsuccessful, and I made the decision to amputate. The amputation was performed in 2001, and I began the process of learning to adapt to living my life without legs. I relied on my wheelchair for everything. In the years since this unfortunate accident, God has blessed me with a magnificent wife and a beautiful daughter who makes me proud every day. I became a public school teacher and I teach math and computer science to children and adolescents. 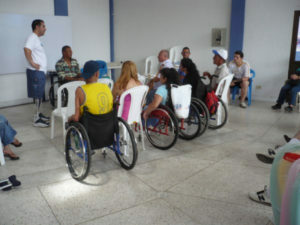 I am also a volunteer for an organization that supports people with physical disabilities. In 2009, my life changed once again. The prostheses I was using allowed me to walk, but caused great pain and wounds that would not heal. Through the efforts of many people who ultimately brought me to POA, I managed to get my quality of life back. I no longer had to suffer with wounds and use crutches to walk. I returned home in comfortable prostheses which allow me to walk comfortably with the help of a small cane. I returned to my family and students a stronger man, no longer plagued with health problems. I thank Stan, John, and the staff at POA for giving me a new life by providing me with the prosthetics that enable me to give more to my family and students. God is good.